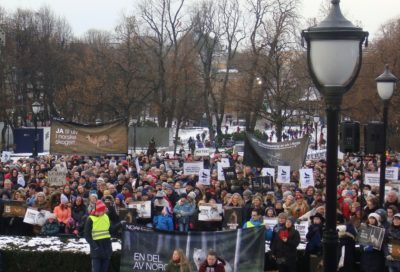 It was the wildlife preservationists’ turn on Saturday to demonstrate by the thousands in favour of protecting Norway’s roughly 60 surviving wolves. As their demonstrations to halt a highly controversial wolf hunt took place in towns and cities around the country, researchers claim the debate over wolves in Norway has become unreasonably bitter and is being blown way out of proportion. The thousands of people out marching and listening to appeals to save the wolves had gathered in response to another demonstration earlier in the week. It was mounted by farmers who feel threatened by wolves, landowners who want to sell hunting rights and rural residents who fear wolves in their area. The only thing the two bitterly divided sides have in common is that they’re all angry with the government and its management of the country’s small but reviving wolf population. The wolves’ protectors claim the government is killing off far too many wolves. The anti-wolf activists claim the government isn’t allowing them to kill nearly enough. 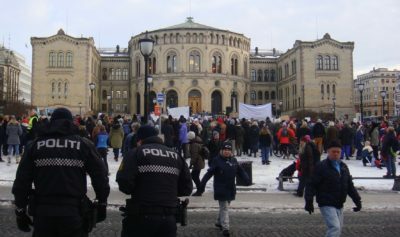 Demonstrators in Oslo were treated to recordings of wolves’ howling that streamed from loudspeakers set up in front of the Parliament building. They chanted that wolves must be allowed to live in Norway, and waved signs with messages including Vi er vikinger, ikke veikinger (We are Vikings, not weaklings). Speakers claimed repeatedly that the vast majority of Norwegians are positive towards wolves, and glad the endangered species that nearly became extinct in Norway has made a comeback. “This is all about how we can live with predators in Norwegian nature,” declared Mads Andenæs from the speakers’ platform. He’s a law professor at the University of Oslo who worries that international objections to Norway’s wolf hunt can lead to boycotts of Norwegian goods and services. Other concerns over an international backlash were aired on national radio this week after Prime Minister Erna Solberg, in an apparent attempt to appease Norway’s powerful farmers’ lobby, proudly, if controversially, claimed that “this government shoots wolves.” Some think the wolf hunt will become as unpopular abroad as Norway’s whaling has been for years. Solberg’s agriculture minister, Bård Hoksrud of the Progress Party, had also defended the government against the anti-wolf activists’ complaints that not enough wolves were being “taken out.” Hoksrud boasted to Norwegian Broadcasting (NRK) that “no other government has killed as many wolves” as the current conservative coalition government. One farming organization leader from Oppland County retorted that was only because Norway has many more wolves (now estimated at around 60) than it’s had in decades. The actual numbers of both wolves and free-grazing sheep killed by wolves is now prompting researchers who compile statistics to react, and claim that the entire debate is bordering on the ridiculous. They can prove that the vast majority of free-grazing sheep are killed by the consequences of what amounts to their owners’ neglect. Many sheep and their lambs injure themselves in the wild, go astray or become ill. Other predators like lynx, wolverines and even eagles and hawks kill far more sheep than wolves do. “Over time, both lynx and wolverines kill more sheep than the wolf,” Morten Tønnessen of the University of Stavanger told NRK. He’s one of many academics, statisticians and wildlife authorities who think the wolf is the victim of an undeservedly bad reputation. “The wolf has become the ‘poster boy’ for predators in general,” Tønnessen told NRK. He thinks the entire wolf debate needs to “be lifted out of the trenches” and up to a far more fact-based level. He and colleagues Petter Bøckman and Lars Lenth have written books entitled Menn som hater ulver (Men who hate wolves) and Ulvetider (literally “Wolf times,” but also an expression used to describe hard times), in an effort to explain how the fear of wolves is largely unjustified. “For the preservationists, the wolf represents the little we have of wild nature in Norway,” Lenth told newspaper Dagsavisen. “For the wolf haters, they’re a symbol of how the government doesn’t care about the rural population.” In Ulvetider, he also writes about how a court, for the first time, convicted five men of illegally hunting wolves. They weren’t farmers but hunters who claimed wolves disturbed their sport. When deer and moose sense wolves in the area, they’ll roam out of it, also leaving some large landowners unable to sell hunting rights at high rates. Tønnessen adds that the strong fears and perceived threats tied to wolves have been around for centuries, rooted in the Bible and Norse mythology. “Jesus took care of a flock of sheep, and the wolf posed the threat,” he notes. Even fairy tales have conjured up the “big bad wolf” image, adding to myths that grip rural communities and where anyone liking wolves can be branded as a traitor. “The only dyr (animal) that should be shot is the bydgadyr,” claimed one speaker at Saturday’s demonstration in Oslo, referring to the term for those who spread rumors and crack down on anyone unconventional in small communities. Around 150 people nonetheless demonstrated in favour of wolves on Saturday in the center of Elverum in Hedmark County, the heart of anti-wolf activism in Norway. One woman told NRK that she was sure many more people would have liked to take part, but were afraid they’d suffer local consequences. 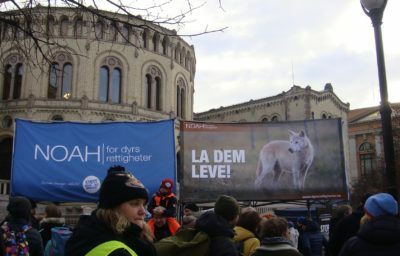 The heated debate over wolves in Norway has become “tragicomic,” according to Lenth, “but those who make the most noise get heard.” Tuesday’s demonstration against wolves in Oslo was noisy indeed, prompting the demonstrations on Saturday that were, by comparison, remarkably calm and orderly. Researchers have also determined that fear of wolves is tied to education levels. Those with higher education often agree that wolves are a natural part of wildlife and should be protected. Ketil Skogen, a sociologist and researcher at Norway’s state institute for nature research (NINA), told Dagsavisen that reaction to wolves is tied to age, education and peoples’ faith in the authorities. Those who are highly skeptical of the authorities and have lower education levels, for example, are often the most negative to wolves. Others, including Lenth, have noted that many who claim wolves pose a major threat have never actually encountered a wolf. When wolf packs started re-establishing in Oslo’s eastern forest, many skiers, hikers and others hoped they’d spot a wolf. Several of them have called it a “memorable” and even “fantastic” experience. Saturday’s demonstrations also held in Fredrikstad, Trondheim, Bergen and Kristiansand. All were organized by the animal rights group NOAH, which has taken the government to court on the grounds their authorization of the latest wolf hunt is illegal in zones where the wolves are supposed to be protected. Siri Martinsen, leader of NOAH, led off the appeals in Oslo on Saturday. “Threatened species need better protection all over the world, and Norway is setting a bad example for other countries,” Martinsen said, to applause from the crowd. The bitter wolf debate took, meanwhile, almost a comical twist when newspaper Agderposten reported this week how Norway’s biggest zoo, Dyreparken in Kristiansand, felt compelled to remove a statue of a howling wolf that sat outside its entrance for 17 years. The statue, created by the late artist Skule Waksvik, included a plaque commemorating what Waksvik called a “wolf massacre” in Stor-Elvdalen, where a large wolf family was hunted down and shot in 2001. Ølberg hastened to add that Dyreparken’s management believes wolves are a part of Norwegian nature, and should be protected. For now, however, the wolf statue remains stored away in a warehouse at the zoo, which attracts around a million visitors a year.